No more Free Lunch Cafe. It is so much fun to play with different techniques every month, but I know it was a ton of work for Linda, and I want her to know that we will all miss her classes and appreciate everything she has shared with us. I wish you the best and hope that life will allow for you to come back to us when and if time permits. This is one of my projects from Free Lunch Cafe. 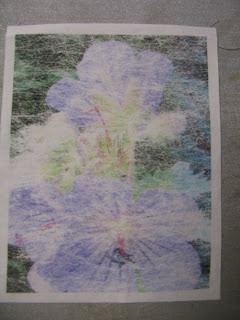 We printed photos on either dryer sheets or fusible web. I didn't have much luck with the fusible web. It jammed in my printer and cause me to say some lovely things to it! :-) We placed a piece of fabric behind the dryer sheet (or web) and then had an interesting print left on the fabric from the ink that wasn't absorbed by the dryer sheet or web. Two distinctly different textures from one step. This has some VERY interesting possibilities! 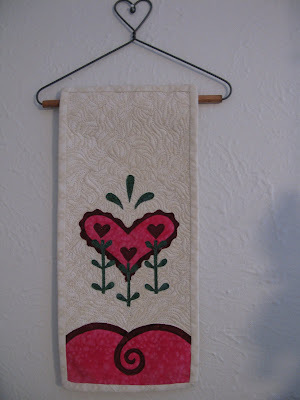 I used my playing around fabric from the paintstick class I took a couple of weeks back, in the project too. Amazing what comes out of basically nothing. Now I need to dream up something to do with the fabric photo here. Any ideas for me????? 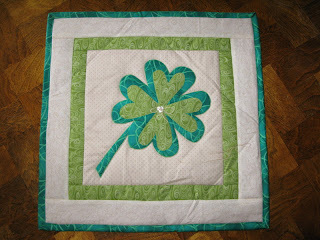 Another wonderful swap with the Quilted Table Yahoo Group. 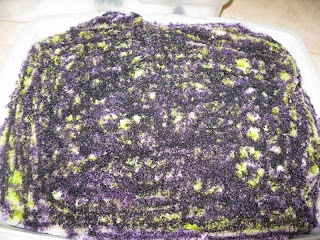 This time was a St Patty's day theme candle mat swap. My friend Viki in Australia sent this beautiful little mat to me. 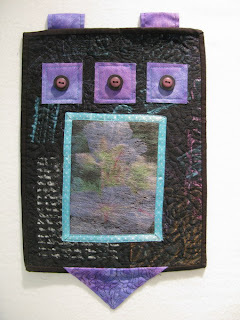 She adapted an image from Google Images and turned it into an applique design. HUMMMMMMM.... I haven't heard of Google Images before, but I am certainly going to do some investigating and see what it's all about. Nothing I like better than more online inspiration. Thank you Viki for a wonderful package. She sent along sticky notes, a Shamrock pin, some adorable little embroidered embellishments a Green fat quarted and the cutest little panel with country animals on it. My thinking cap is on, for ideas using the panel! Hope you all have a good week, and take a look at Google images for some inspiration too! With the snow around the country piling up, I am scraping the last of the flakes from my yard to dye some fabrics here the past couple of days. 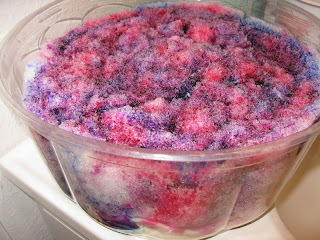 All the reading on the subject online got the fire started with me, and I just had to dig out all my dyeing supplies. 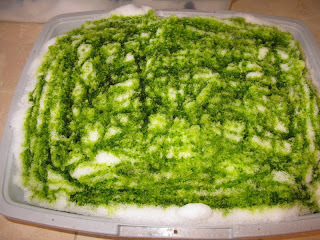 Never in a million years did I expect the fabulous results that come from dyeing fabrics with snow. I am truly hooked on this technique now and am patiently awaiting for some more snow to fall. If my weather man is right I should see some in the next couple of days. In the mean time I am going to share the steps for this project. It is just too much fun to keep to myself. 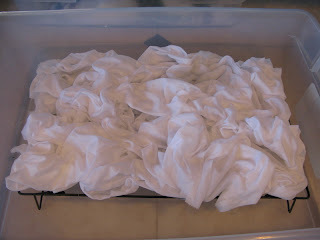 First you soak your fabric in a soda ash solution as always in fabric dyeing. Then you arrange it onto a rack of some kind. I bought Wilton cooking racks. (I read that this was absolutely necessary, but in my different batches I used them on some and others I did not. 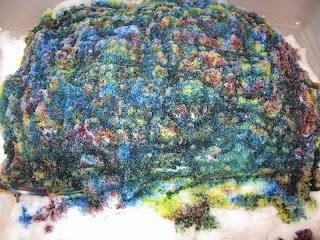 I am not sure there really was much of a difference) The thought behind it is to keep the fabric out of the melted snow and dye mixture in the bottom of the pan. I really think that by the time it all melts, the dye is expended and it doesn't really make a difference, but what works for you is best. Now the fun begins. You mix up your Procion MX dyes and put them in a squirt bottle. I used 1 tsp of dye powder to 1 cup water. You just squirt them on the snow. I didn't do any sort of pattern, just played with it a bit. 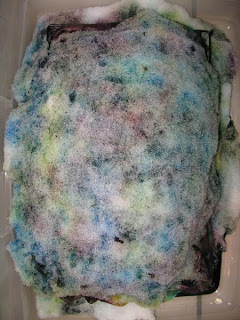 For my first project I used 3 colors Lemon Yellow, Black Cherry and Electric Blue all from Dharma Trading Company. Below is what it looked like with each new layer added. This was like building a very large snow cone! Now you wait. I put it up, and just not so patiently waited for all the snow to melt. It was about a 6 hour process in my house. I put the trays on the bathroom floor and closed the door to keep the cat out of it, and I found that the bathroom got very cold in the process. It would probably work better or at least a little faster if there had been a little more heat in the place! 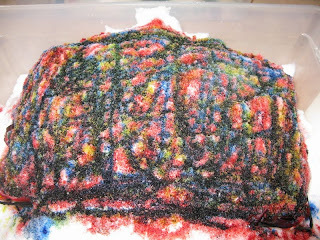 You can see some of the different batches as they melt away. 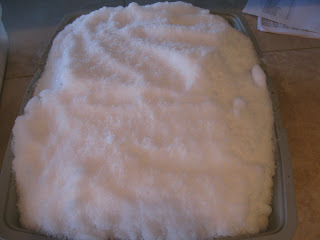 It was exciting to see the fabric appear from under the snow and see what was happening to the dyes. 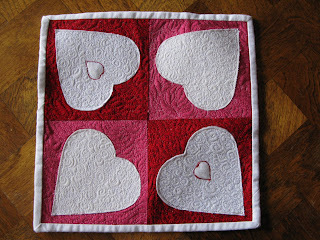 A little more practice free hand machine quilting, and these little projects are just the ticket. Fast fun and easy! Could you ask for more? Had a wonderful time at the sewing expo last weekend. The class with Mark Lipinski was wonderful. He taught is how to sew curves with no pins. What a treat, and it worked out quite nicely. The mystery quilt ended up being 5 different blocks that you could create about a million quilt designs from. What fun to see everyone's fabrics, and the designs they came up with on their design walls. It was so inspiring. I just can't seem to quit playing with the blocks. I guess I will know what design, my top is destine for, when I can't find another combination to play with. Need less to say Mark is hilarious. I had a 7 hr class with him and then attended a 2 hr talk later that night that ran way over 2 hrs. He was so funny, that we laughed until we were about all in tears. If you get the chance to take a class or hear him speak, do so. It will be the best time you can possibly have! 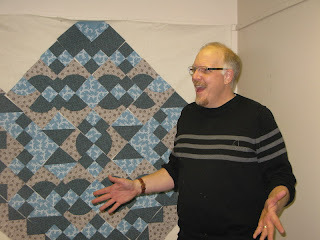 The photo below is of Mark and the quilt is not mine, but a design that I just loved! I also took a class in Shiva Paintsticks. I have bought a ton of them a few years back, but have never opened them. Not sure if it was fear or ignorance, but they are sure fun to play with. I am so glad I took the class and broke into those lusious packages. While we just played with different techniques and rubbing plates. I did come home with a few pieces of fun fabrics from it all and I managed to cut one up for a little art project this week. I'll show you that in a few days here. My heart goes out to those on the east coast that are getting the feet of snow. I have been working at the airport with some that have tried to get home for days. It looks like they are going to have to spend a little more time in our mile high city before they can get back to their homes. Geesh, who knew they wouldn't have to come to Colorado for that big ski weekend. Could have had it in their front yards! Just a couple of weeks away now and we will be celebrating Valentines day. 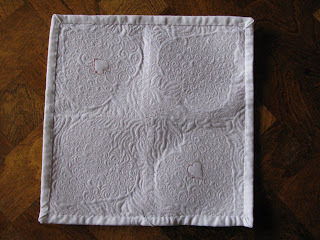 To get a head start on the season, I put together one of these fast and fun little candle mats, a part of the Quilted Table Tablerunner January Challenge. It was the perfect project to work on some of my domestic machine quilting skills (or lack of) :-) I have to say, that there is a sense of accomplishment when you are able to do a small project and see it completed in a couple of hours. I am very new at the domestic machine quilting. We have a little "Club" at our local quilt shop that is just a ton of fun. Playing not only with movement, but threads, fabrics and battings is a blast! If all goes well, I might even become semi efficient with this little process. Here is the back view, which I think I like as much as the front! Grab a couple of fat quarters and some batting, drop thoses feed dogs and give it a try, you will be surprised at how much fun it can be! Caution though, it may become addicting!